OMG, today I found the WEIRDEST thing at Goodwill!!! Something I NEVER expected to find there! My mom had dropped me off to find some jeans while she was grocery shopping across the street. Some people might feel weird about buying clothes someone else already wore, but here’s a secret: thrift store jeans are the BEST. They’ve already been broken in, so they’re totally super soft! I found my size and started going through the racks. Goodwill is kind of like a treasure hunt. You definitely have to dig through a whole lot of stuff your grandma wouldn’t even wear to find the treasures, but they’re SO worth it when you do! I was digging through acid washed jeans from the 80’s and jeans with sparkly butterflies all up and down the legs. Every ten pair of horrific jeans, I’d find a good pair and dump them into my cart. I was starting to pull out the softest pair yet when someone on the other side of the rack reached for them too. Before I could see her face, she yelped and ducked down. “You can have the jeans if you want,” I called over the rack. But she didn’t respond. Maybe she was really shy. Or afraid of shopping confrontation. I mean, it wasn’t exactly the last art set on Black Friday. But whatever. I kept looking. A minute later, the whole rack in front of me began to shake. At first, I thought we were having an earthquake! I looked over my shoulder to see who she was talking to. “I’m just picking out jeans, ma’am.” I thought I’d said it politely, but I could tell from the look on the sales clerk’s face that she thought I hadn’t. I’m pretty sure the whole store heard her! My face was bright red. I didn’t know WHAT was going on! I just wanted her to go away. “Yes ma’am, I’m sorry!” I shrugged. As soon as she was gone, the rack shook again. I shoved open the clothes. And there, crouched inside the rack of thrift store clothes was MACKENZIE HOLLISTER!!! She climbed out, glaring at me like I was the weirdo. “Are you STALKING me, Nikki?” she said, picking sweater fuzz out of her hair. “Yeah. THRIFT store jeans.” She turned her nose up. What on EARTH was MacKenzie Hollister doing in a thrift store??? Not that there was anything wrong with that—I was there to get some awesomely soft jeans, after all. But MacKenzie? She would NEVER wear second hand clothes!! MacKenzie’s eyes bugged out as she spluttered in protest. MacKenzie and I both whipped around to see who was calling her Mac. I had never heard THAT before!!! A woman who looked like MacKenzie in about fifty years stood there, with a cart piled high with the most random stuff. Lacrosse sticks, floor lamps, picnic baskets, a tricycle. She tottered on enormous fuschia high heels, and wore skin tight jeans and a leopard print leather jacket. “I’m coming, Meemaw,” MacKenzie hissed. Then MacKenzie stuck her nose into the air and sashayed away. I just HATE it when that girl sashays! If she’s too embarrassed to be seen shopping at Goodwill, then she should’ve went to the mall instead! Is there a place you were at or an activity you participated in that caused you extreme embarrassment? I’d like to hear all the funny details! That was like….. Impossible Wacko that you just saw Nikki! Mackenzie….. At Goodwill???!!! Are you sure you did not hit your head or something? That’s like, unordinary! 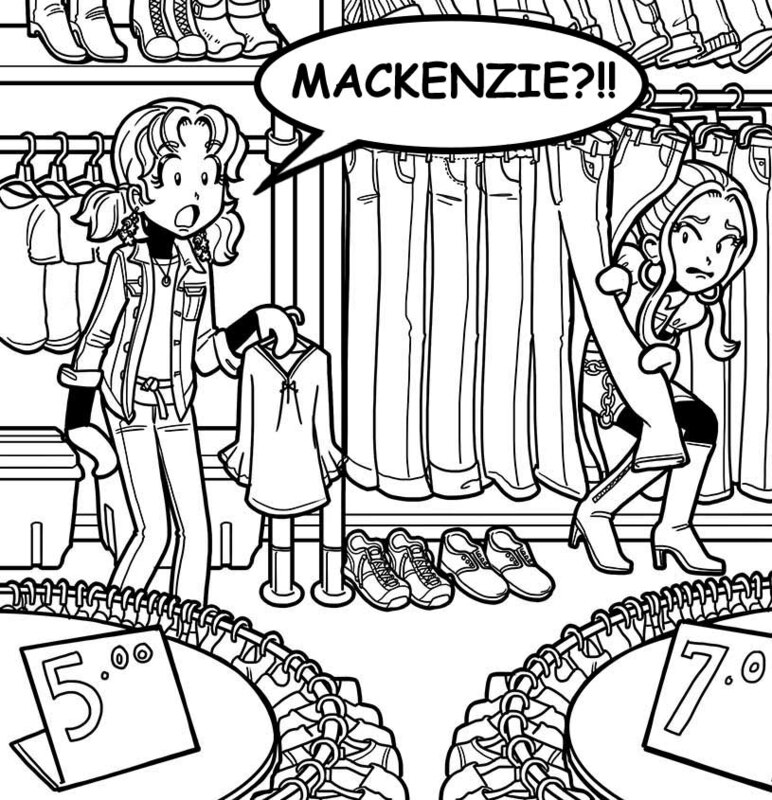 Sigh…Why can’t you and Mackenzie get along? I don’t want to hear the ” Because she is stuck up” blah blah, We’ve heard it a thousand times! Just breath and be nice to her no matter what! That’s good advice for you , i hope!